ATJ's Home Improvement | News and Alerts | Can Heavy Rain Cause Damage to the Roof? Can Heavy Rain Cause Damage to the Roof? This spring has blessed Chicago with plenty of rain, and some folks are getting a little bit tired of the blessings. According to the meteorologist Tom Skilling, it’s rained 15 of the past 22 days, and since April 20 the official rain gauge at O’Hare International Airport has collected 5.01 inches (the norm would be 2.44 inches). So far, we haven’t seen a big hail storm, but knowing how weather in Chicago works, golf ball size hail might start raining down somewhere in Chicagoland before we’re done with this post. It’s common knowledge that storms, especially hail storms, often damage roofs and other building structures. But what about the rain itself? Can heavy rain cause damage to the roof? The answer is “yes”, because even if there’s no hail, heavy rain is almost always accompanied by strong winds, especially in the Midwest plains. As far as your roofing structure is concerned, rain and wind means physical contact and friction. The longer it lasts, the stronger it is, the more stress it puts on your roof. If your roof has already been through a lot, it’s a matter of time till that proverbial last drop causes some serious damage. If you start seeing shingles where they don’t belong -- that is, not on your roof -- it’s the first sign of serious damage. Due to heavy rain, shingles become loose, leaving bare spots, which can then cause water damage to your roof’s structure. When rain damages the integrity of your roof, water can find a way underneath your shingles, causing warping. This will be apparent in the curling of your shingles or buckling in your roof. If there is buckling, most likely water damage has occurred. “Buckling” simply means that your asphalt shingles are not laying flat due to the wrinkling of the roofing underlayment or the movement of the wood deck, which mostly happens due to water damage. Not to be an alarmist, but this is not good… and, yes, the alarm responsible for waking up a concerned homeowner in you should be sounding off. When you see mold inside your attic, that means water is coming from somewhere, most likely your rain damaged roof. Wood-rot is common if the water has been standing for some time, either on your roof or inside your attic. In cases where fungus is growing and visible on your roof, that’s usually caused by trees and vegetation. You will want to have your roof inspected as fungus can be a sign of damaged shingles. It’s worth noting that different types of roofs exhibit different signs of water damage. Slate roofs will show distress by the appearance of cracks in the tiles. These cracks can be fairly noticeable, but they can start out as hairline fractures that are pretty hard to spot. Metal roofing has a reputation of being very durable, and for good reason. But, just like any other building material, it’s not completely immune to weather elements. Small dips, divots and dents can appear in your metal over time, allowing precipitation to slip in between the cracks and do some damage. 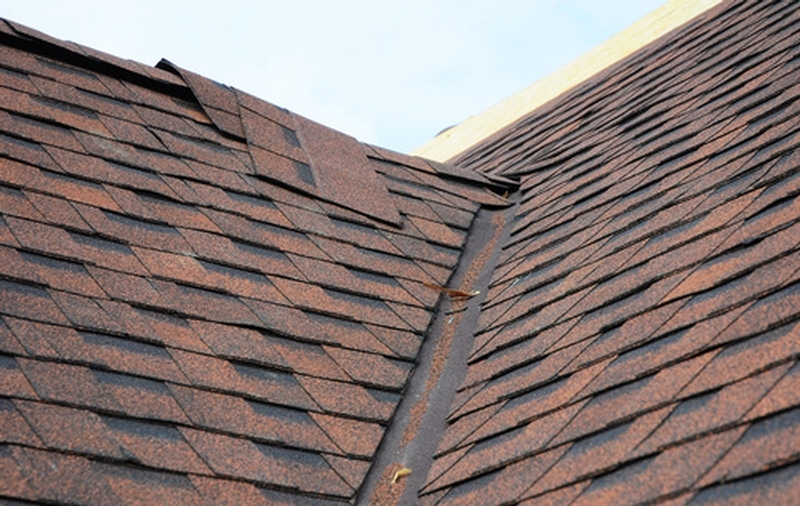 Cedar Shake roofing has a tendency to split under severe weather stress, leaving obvious cracks. Another possible spot of trouble is fraying, which is caused by slow rot from moss growth under the shake. Just as always, cracks are a clear indication of trouble, but flat roofing comes with some other signs of distress. Water ‘pooling’ or not draining off your roof can be a sure sign of serious damage.